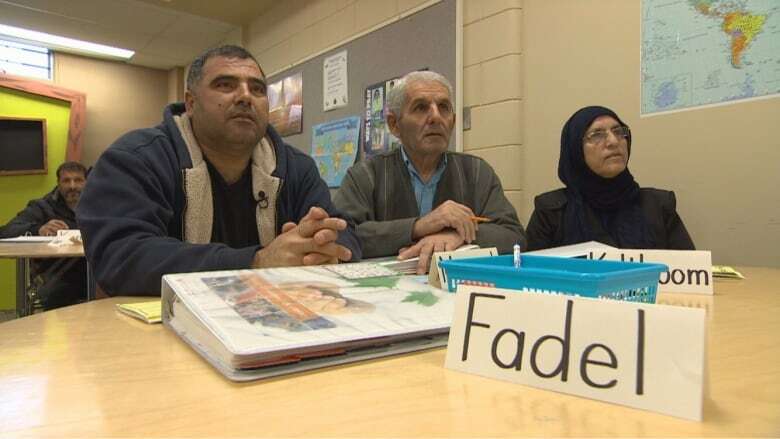 Fadel Ahmad works every day to learn the language of his new home, taking English classes through a federally funded course as he and his family work toward becoming Canadian citizens. Fadel Ahmad has faced many struggles since his family came to Winnipeg as government-sponsored refugees almost two years ago, but the father of four refuses to complain. Speaking in Kurdish, translated by his daughter Yara, Ahmad, 42, has nothing but praise for what the Canadian government has done to help them resettle. "Canada good. Thank you, thank you, Canada," he said. "People Canada good, yes." The Ahmads — Fadel, his wife Rania, 40, their sons Mostafa, 14 and Mohamad, 9, and daughters Yara 15 and Eman six months — were part of Prime Minister Justin Trudeau's commitment to resettle more than 40,000 Syrians fleeing their war-torn homeland. Unable to speak English, Ahmad hasn't been able to get a job, so he works every day to learn the language of his new home, taking English classes through a federally funded course. His family lives in public housing and received financial support for the first year. Now, employment insurance just covers the rent. Other than the language course and some medical coverage, Ahmad is mostly on his own to support his family, though other Syrians in the city have helped the family. Ahmad is learning to paint and hopes to be working soon. Their story is just one of many faced by Syrians who relocated to Canada, and whose struggles aren't being monitored closely enough by the government, according to Michael Ferguson, the auditor general of Canada. In a report released this week Ferguson says the government hasn't done enough to collect information from the provinces about Syrian refugees to measure things including access to health care and school attendance. ​Ahmad, who grew up near Aleppo, left for Lebanon as a young man searching for work. When the war broke out in Syria years later, he gave up on returning and successfully applied to come to Canada. He has been taking his language course at Winnipeg's Mosaic Newcomer Family Resource Network, which has seen a surge in people needing its services. Executive director Val Cavers says they can't keep up with the demand. The centre, in Winnipeg's Central Park neighbourhood, offers on-site childcare for those taking programs. The childcare service is full, which means some people can't even get into the programs. "Some parents have two or three children that they have to bring, so they have to wait a little bit longer [for space to get into the program]," Cavers said, adding 90 per cent of the students are women. "It's a huge barrier for women that aren't able to come to class without the assistance of having on-site child care. The topics that we cover in most of our classes are things that are relevant for parents." Ahmad's children have been adapting to their new life, picking up the language quickly in school. And Rania will soon start her English classes. The family hopes to one day gain Canadian citizenship, though one of them already has. The Ahmads' daughter, Eman, was born six months ago in Winnipeg, and therefore is a Canadian citizen.